Although always heavily intertwined in the politics of Galicia, Leon, Castile, and Aragon, the people of Portugal have remained independent since their kingdom's establishment by Henrique of Burgundy and his son King Afonso I. Similar to the people of Galicia, having separated from this old kingdom less than three centuries ago, the Portuguese culture was less influenced than most of Iberia by the Visigothic and African conquests that dominated the peninsula after the decline of Rome. The linguistics, beliefs, and customs of these people spring instead from the region's ancient Roman and Celtic inhabitants and the more recently arrived Germanic tribes of the Suebi. While these groups were quite diverse, they all found prosperity in the region thanks to its fertile hills and bountiful rivers, and the resulting culture has become firmly based upon the importance of these waterways and the sea they flow into. The Minho, the Douro, the Mandego, the Tejo, and their many sisters have kept the splendid cities of Braga, Porto, Coimbra, and Lisboa well fed and prosperous, and its people become renowned sailors in their pursuit of further exploiting Portugal's rivers and coastline. 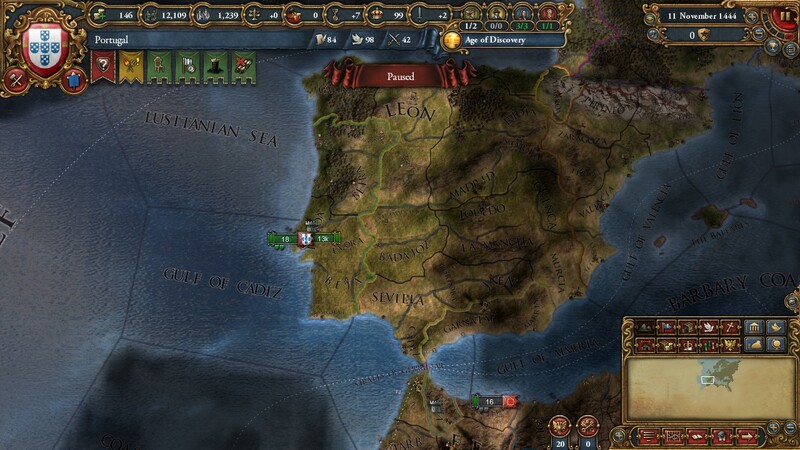 While the kings of Portugal completed their own Reconquista two centuries ago with the conquest of the Algarve, their neighbors still pursue complete Christian control of the peninsula. King Joao and his sons, especially The Navigator, have instead led Portugal to exert its strength across the sea and continue the crusades by ship as well as sword. The Avis line is inextricably rooted in the militant Holy Order of Avis, and the monarchs have so far lived up to this heritage. 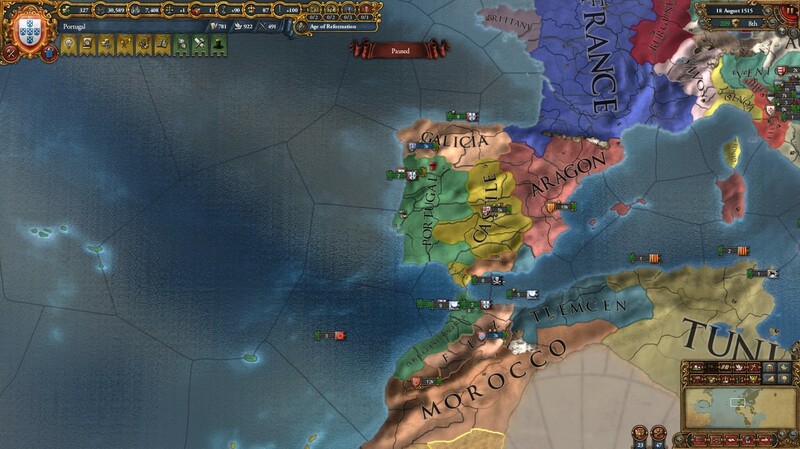 Boldly, the Portuguese seized the port of Cueta from the divided Muslim nobles of Morocco and have successfully defended this African foothold for decades. 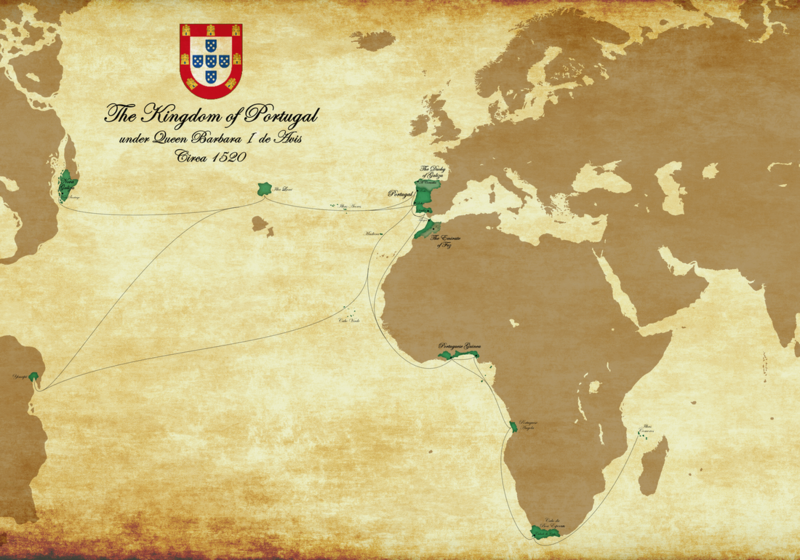 ​This first step, the start of Portugal's overseas influence, was soon followed by the discovery of the fertile and uninhabited islands of Madeira and the Acores which have now been colonized by Portugal's sailors and are quickly becoming productive provinces in their own right. However, the Portuguese soldiers ran into conflict with their powerful neighbor, Castile, when they attempted to similarly expand their rule over the Canary islands. They were forced to abandon their claim over these lands and its indigenous people when Castile enlisted the support of the Holy Father in Rome to settle the dispute. Now the throne is held in regency by Infante Pedro for Joao's young grandson, but the nobility remains seemingly loyal to the young monarch, and the kingdom's alliance with England, established in the Treaty of Windsor, has remained strong. 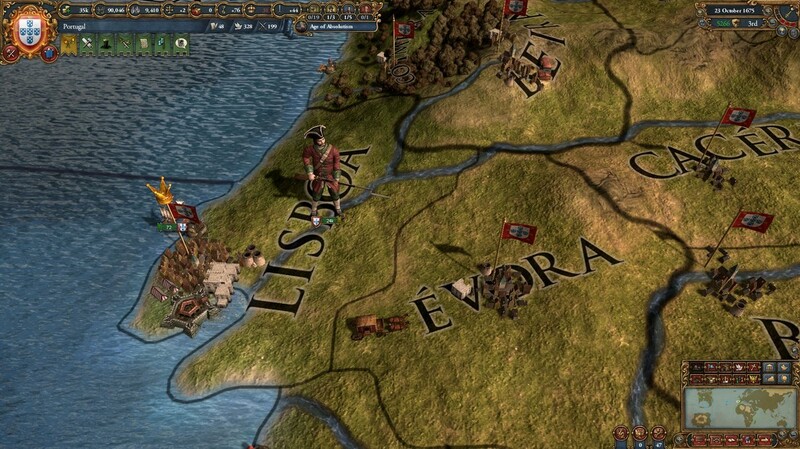 If their monarch can continue to foster stability and progress in Lisboa, Portugal's enterprising explorers are destined to lead their homeland to further greatness, and lift the nation from Europe's political periphery to the forefront of this Age of Discovery. Having ascended the throne quite young, King Afonso was assisted in his duties by his uncle Infante Pedro, the Duke of Coimbra. Pedro ruled well, but the wider nobility took objection to his influence over the king. Soon after Afonso came of age, and Pedro abdicated his position, a plot appeared to turn the young king against his mentor. Fortunately for the kingdom, Afonso chose not to trust his courtiers and Infante Pedro remained a powerful figure and ready adviser to the king for many years. 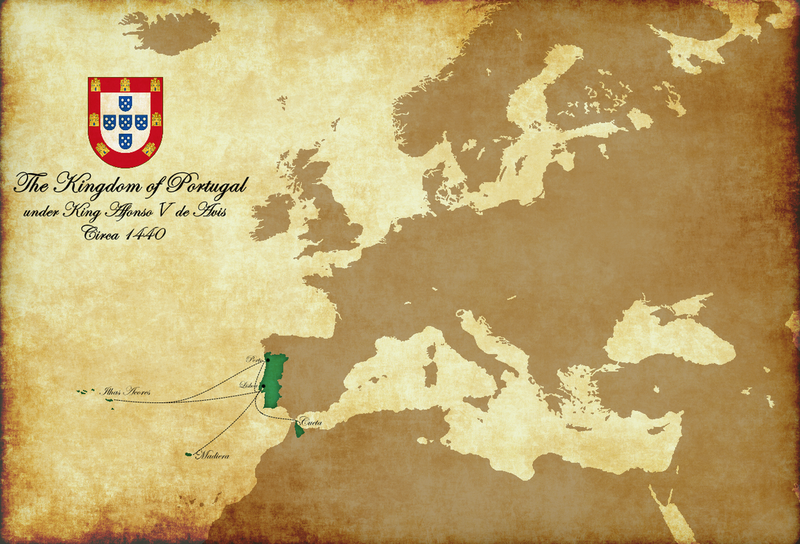 While not without cost to the royal treasury, the ambitions of Prince Henrique and Gomes Eanes de Zurara did much to begin Portugal's advance out of the middle ages. Fascinated with sailing and the unknown opportunities of exploration, Afonso's youngest uncle continued to push the Portuguese nobility to support the overseas expeditions that had already expanded Portuguese rule of Madeira and the Acores, and further resulted in the exploration of Africa's Gold Coast and the establishment of a prosperous colony on the Cabo Verde archipelago. Gomes Eanes de Zurara, a historian and philosopher at the royal library, quickly recognized that he was watching history in the making and astutely put these pursuits to paper. His laudatory accounts of Portugal's royal house quickly traveled through Europe spreading the kingdom's fame and influence abroad. With a foothold in Cueta, Infante Pedro advised the young king to pursue further control over trade through the Strait. 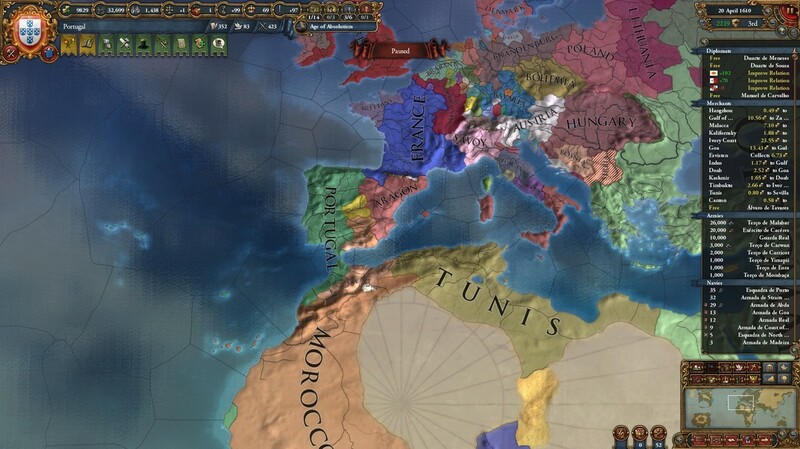 Sevilla, the most prosperous mercantile center, was firmly in the hands of the Castillian king, but the Moroccan city of Tangiers was a favorable target. Couching the enterprise in the rhetoric of the Crusades, King Afonso brought the Castillians aboard with promises of Muslim land in Granada. However, the king also wanted to bring the conflict to the Tunisians, whose sultan dared to assist the Moroccans on land and at sea and had embargoed Portuguese merchants for years. To assist in this goal, King Afonso found a ready ally in the Sultan of Tlemcen, who offered to bring his own soldiers into the conflict. In the end the Tunisian sultan accepted a humiliating treaty and the Portuguese asserted their claim over Tangiers and also gained the fealty of the emir of Melilla. The Castillians, whom King Afonso felt threatened the independence of his kingdom, were awarded only token holdings and treasures. Instead Afonso allowed the Sultan of Tlemcen to retain control of his conquests across the Strait in the lands of the deposed Emir of Granada, lands coveted by Castile. 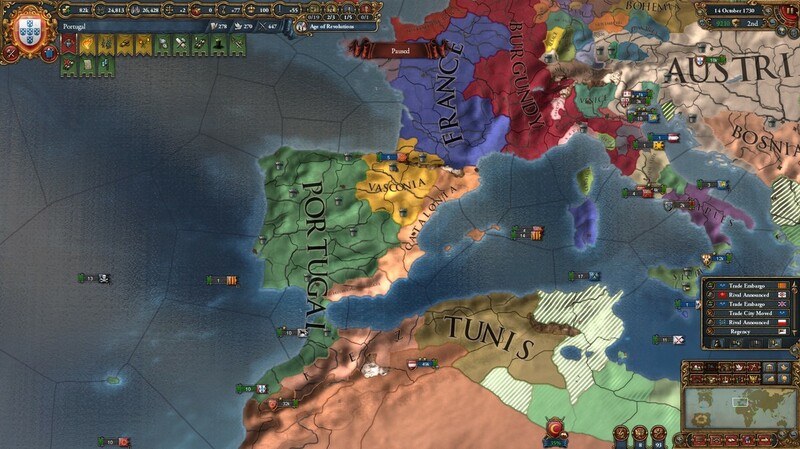 The alliance between Castile and Portugal would dissolve soon after. After the death of the King Juan of Castile, the nobility of Portugal was alarmed by increasing talk of a union between his daughter, Juana, the newly crowned Queen of Castile, and the King of Aragon. Such an alliance would place Castile securely in control of the Iberian peninsula and leave Portugal clinging to the periphery, constantly under threat of being engulfed by their growing power. The Aragonese nobility likewise foresaw themselves being perpetually placed in the shadow of Toledo, and pressured their monarch into alliance with Portuguese instead on the condition that King Afonso withdraw from the Treaty of Windsor. This treaty, many decades old, bound Portugal in alliance with the English king, but the English were on foul terms with the Aragonese due to various complex and opaque grievances involving claims in Aquitaine and interference in the ongoing English conflict with France. Hoping to end Castilian dominance of Iberia, King Afonso consented and quickly forced an armed conflict with Castile regarding the duke of Braganca's claim over the prosperous Castilian city of Salamanca. Afonso intended to drive a permanent wedge between his fellow kingdoms and a bloody war enveloped the peninsula that concluded only after Portugal and Aragon had obliterated the Castilian armies and occupied the majority of the kingdom. Forced to meet her enemies' terms, Queen Juana consented to Aragon's claims on the southeast of her realm and surrendered Salamanca to King Afonso. Furthermore, the house of Borja, formerly minor Galician nobility with holdings in Porto, was granted the entire duchy of Galicia along with all Leonese lands north of Salamanca enfeofed to the title to hold as vassal to the Portuguese crown. Despite the humiliating treaty, the union of Aragon and Castile proved to be inevitable. Queen Juana was now desperate to ensure Castile's security and the Aragonese nobles had grown less opposed, no longer afraid of being overshadowed by the their weakened neighbor. Fortunately, the union would be weak and never achieve stability over the years as the strong Aragonese nobility constantly undermined the Castilian monarchs. Within a decade, the Aragonese nobility would install a distant French relative as their king, severing ties to Castile after seizing much of the disputed provinces between Toledo and Valencia. To extend the buffer zone between the Portuguese market cities and the lands of the Moroccan sultan, King Afonso desired to extend his control over the coastline of Gharb and the fertile flatland south of Tangiers. He once again found common cause with the Sultan of Tlemcen, rival to Morocco and its ally, the Sultan of Tunis, but the ensuing conflict was taxing and hard fought. Afonso reignited conflict with the Moroccans by sending soldiers to Fez under the command of Emir Ahmad Marinid of Melilla, a cousin to the Moroccan ruler with ancestral claim over the great city. Having fallen from favor in the Moroccan court, King Afonso had found the Emir of Melilla willing to turn against his family in his previous war against Morocco and now held the Emir in vassalage. In return for his assistance, Afonso had granted Melilla the freedom to remain Muslim and promised to elevate the young Ahmad to rule over all of Morocco. Both aggressors suffered losses that brought them on the defensive more than once, but while the Moroccan army surrounded and besieged Cueta, King Afonso and the soldiers of Tlemcen brought the Tunisians to an understanding outside the walls of Tunis itself. Shortly after, Afonso finally secured his claim over the beaten Moroccans, and extending Emir Ahmad's control over Fez and its many holdings. As the Portuguese explorers charted the coast of Africa past Sao Tome, they encountered a large African kingdom that appeared much more unified and politically advanced than the multitude of tribes the explorers had found so far. However, these people knew nothing of Christianity and still followed a primitive and pagan religion. The missionaries of Portugal who chose to brave the jungles and go among these people found a surprisingly welcome reception and substantial success among the villages of this newly discovered kingdom. Only a year after the initial meeting of the two cultures, the king of Kongo himself converted to the Christian faith and soon stories of thousands of new converts and dozens of church constructions were spreading all the way to Rome and beyond. Attributed to the efforts of Portugal's queen as much as to the itinerant missionaries, this resulted in substantial fame for the Portuguese court as well as surprisingly significant influence within the Roman Curia. Sponsored first by King Afonso and then by his daughter, Queen Barbara, the discovery of the islands of Lumi and Clio westward of the Acores by Cristobal Colon, spurred further exploration of the Atlantic Ocean, but decades past with nothing found but more water. Over the years settlers eagerly migrated to the island of Lumi, considered a fertile paradise my many despite its isolation. Unlike Madeira and the Acores, Lumi was already inhabited by a small population of natives, a strange and primitive people who seemed to be confined to the island with little or no contact, even with the similar tribe found upon Clio. Hostile to the early settlers, most of the native population was soon killed in the frequent fighting or by illnesses that seem to have arrived with the Portuguese. What little remained integrated into the rapidly growing Portuguese towns as the settlers civilized the island with agriculture and mining. Eventually, the continued investments of Portugal's intrepid mariners paid off with the discovery of new land much farther west. As they began to chart the coastline it quickly became obvious that this new world dwarfed the islands found thus far. Taken from a novel popular in Lisboa at the time that referenced a wondrous mythical island populated by Amazonian warriors, the sailors dubbed the newly discovered land Crafagh and reported encountering many diverse tribes occupying villages along its shore. Still famed for the conversion of Kongo and the wars against North African sultans, the few Portuguese cardinals within the Holy See gained further influence when Queen Barbara exhibited her nations piety and prosperity with the construction of the impressive Jeronimos Monastery in Lisboa, funded by the exotic goods making their way to Portugal from their colonies in Africa and Crafagh. When the old Milanese Pope passed on, Portugal found itself well regarded within the Curia and the following election resulted in the ascendance of a Portuguese cardinal to the holy office. Pope Clemens VII, much indebted to the Portuguese throne, would be a helpful partner for the length of his reign, and would be followed by Innocentius VIII, another son of Portugal. The African coast was plentiful in dyes, sugar, coffee, and ivory for those who could tame the wild jungle and its people and the Portuguese were not alone in trying to capitalize on these resources. Queen Barbara was well informed of the efforts of Castillian settlers near her own colonies and took steps to ensure that most African goods would move through her own merchants. The Portuguese already controlled the most important harbors, along the Costa do Ouro, but the Queen knew that control of the Niger estuary could give her nation access to trade from the African interior. Her generals assured her they could conquer the towns controlling the river mouth and so the war began against the tribes of Benin and their many allies. 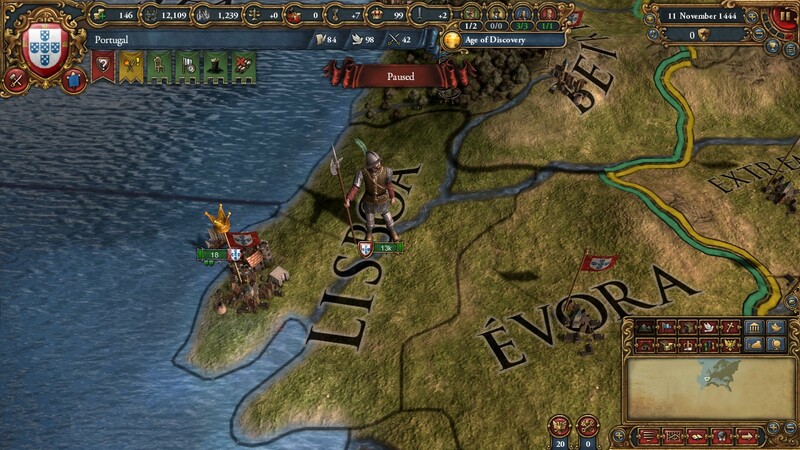 Despite unfamiliarity with the local terrain, European military tactics proved superior and Portugal pushed the heathen tribes away from the river and extended their domains along the African coast. Realizing that reigning over a distant and alien people would require a new paradigm, Queen Barbara turned to the kingdom's most successful trader and merchant, Cactano de Andrade, in order to best capitalize on her dominant position in the region. With his advice the West African Trading Company was founded, a new concept and first of its kind in Europe. Within the next five years the chartered company had grown confident enough in its control of the local populace to extend its reach inland, taking vast sugarcane farmland from the Ashanti tribe in Denkyira, north of Costa do Ouro. Although the Hungarians and Austrians were facing a growing Ottoman Empire, Portugal was still famous throughout Europe for its own struggle against the heathens. The nobility, proud of this reputation, constantly pressured the queen to lay claim to all of Morocco in the name of Christianity, but the crown generally saw much easier gains to be made elsewhere with much safer investments. Eventually, however, war between the various Sultans of North Africa made the opportunity to great too ignore. Regiments from Lisboa and Porto joined those in Cueta and marched to occupy the Moroccan land as far south as Safi. The Moroccan armies, already bloody disorganized from conflict with Tlemcen, were quickly defeated in battle and Portugal's new claims were never strongly contested. Starting on the island of Lima and continuing on more distant Nova Galiza, the rewards of colonizing the vast new lands being discovered far across the Atlantic ocean had attracted vast numbers of Portugal's subjects. Soon a substantial population of Portuguese were living far removed from Lisboa, on the huge island of Nova Galiza off the coast of the newly discovered continent dubbed Crafagh. For these towns and families, it quickly became apparent that communication and rule directly from Lisboa was inefficient and impractical. Already, unofficial local leaders were being chosen to arbitrate matters of law and regulate common resources as a matter of necessity, and Queen Barbara decided that a level of local autonomy for her distant subjects would be necessary if the colonies were to be expected to prosper. Soon after, the first colonial charter was drafted, delegating most responsibilities of the rule of Nova Galiza to the office of Colonial Governor, a title that would be elected by growing colonial townships and serve at the pleasure of the crown. As the Reformation was breaking out across northern Europe, and Portugal was coincidentally finding itself ruling over an ever growing number of heathen subjects. These twin concerns made the Portuguese queen quite receptive to the newly formed Jesuit society and the order quickly became well established in Lisboa and across the kingdom. These newly trained priests proved very successful in their evangelistic mission and this period saw unprecedented conversion to the Catholic faith from the pagans of the African colonies to the Muslims of the Moroccan provinces. Furthermore, the heretics of the Reformation never showed any evidence of gaining a foothold in the kingdom. Unfortunately, Emir Ahmad, the Queen's Muslim vassal in Fez, was becoming an embarrassment for the Portuguese court amid this new commitment to Catholic conformism. The lords of Lisboa had long begrudged sharing control of Atlantic trade in Iberia with Toledo, and Queen Barbara was well aware that her rival's grip was rooted entirely in the Andalusian city of Sevilha. In her war to claim this important trade center, the Queen's enemies were unable to mobilize a notable defense of Toledo. Surrounded by the Portuguese and Aragonese, the Castilian army was quickly scattered before its distant allies could come to its aid. The Portuguese fleets stood their ground against the formidable English navy and were able to blockade London for much of the conflict and prevent English troops from entering Iberia. Lisboa, and the newly constructed Tower of Belem, were only briefly besieged by the forces of Castile while Portuguese forces were similarly engaged in subduing various Castilian castles. Supplied via the Tagus river, the city easily held out until relieved. The resultant treaty secured Sevilha for the Portuguese burghers, expanded the Galician hold of the northern coasts, and allowed Aragon to claim much of the Castilian heartlands. As the sailors of Portugal mapped the route to India, they quickly noticed that any attempt to ship the regions wealth homeward would quickly run afoul of the sultanate of Kilwa which controlled the coasts of East Africa. 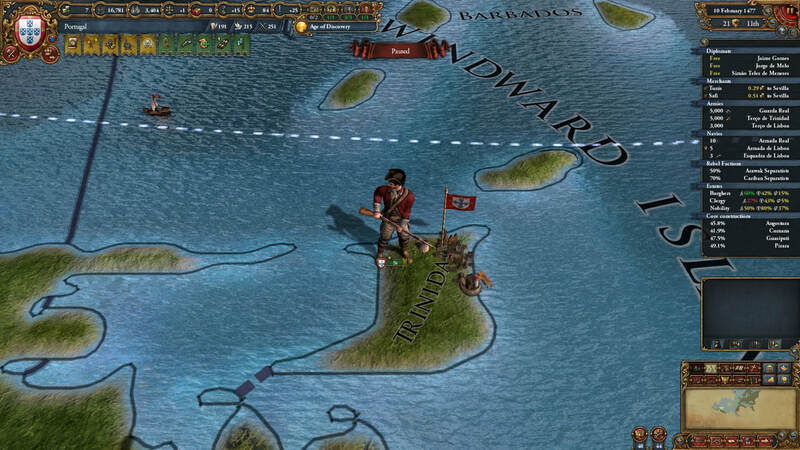 Any ship seeking harbor on the long journey, or even passing through their waters would suffer from either their taxation or piracy, if not both. Given their success against the tribes of West Africa, Infante Henrique and his mother, the Queen, were confident that Portugal next step toward India must be in subjugating Zanzibar and its surrounding coastline. The burghers and nobility heartily supported the venture, which promised great control over the regions wealth, and the kingdom's clergy would gladly lend their aid to victory over another heathen sultan. Risking vulnerability to any offense from Castile or the Moroccans, Henrique led the majority of the Portuguese army as it sailed to the new colony of Comoros, and from there launched his invasion of first Zanzibar and then Kilwa. Soon after the first battles, resounding victories for the Portuguese, that Henrique received word of his mother's death back in Lisboa. The campaign turned for the worse after that, and the new king's army fought a series of brutal battles against the Swahili natives, losing almost as often as winning, with a definitive end remaining elusive. After one last close defeat against the numerous enemy, and with word of a Usurper have occupied far off Lisboa, Henrique settled for half of the coastline he had dreamed of taking from the sultanate of Kilwa, including the islands of Zanzibar. In Lisboa, Garcia de Souto, had crowned himself king of Portugal, on grounds of Henrique's rumored illegitimate birth, but King Henrique with his battered army still loyal, landed at Faro and crushed the usurper outside Sevilha. With the Jesuit society surging in popularity and the arrival of the Inquisition with Papal sanction, King Henrique was aware of increasing hostility between his Christian subjects and his vassals in Fez. Cognizant that his power in Fez was entirely propped up by the crown of Portugal, Emir Ahmad was willing to convert to his liege's faith and prosecute the conversion of his people, but only under conditions of independent rule and full authority within his own realm. Considering that a Christian ally in North Africa would now be more valuable to him than a heathen vassal, King Henrique accepted the new arrangement and Ahmad was publicly christened as the independent Duke of Fez. ​Having charted the sea routes from Europe to India, and with numerous colonies along the coast of Africa to facilitate trade between the two, only the powerful monarchs of India stood between Portugal and the spice trade. Vasco da Gama, an explorer sponsored by the Portuguese crown, greatly pleased the Portuguese king by securing generous trade rights from the sultan of the Bahmanis, granting free reign to trade in India and even securing the city of Goa as a protected harbor for Portuguese shipping and military activity. The duplicitous means employed by Vasco to obtain these rights meant that their Indian benefactors would later have good reason to turn on the Portuguese, but King Henrique had no intention of allowing this toehold to slip from his grasp. 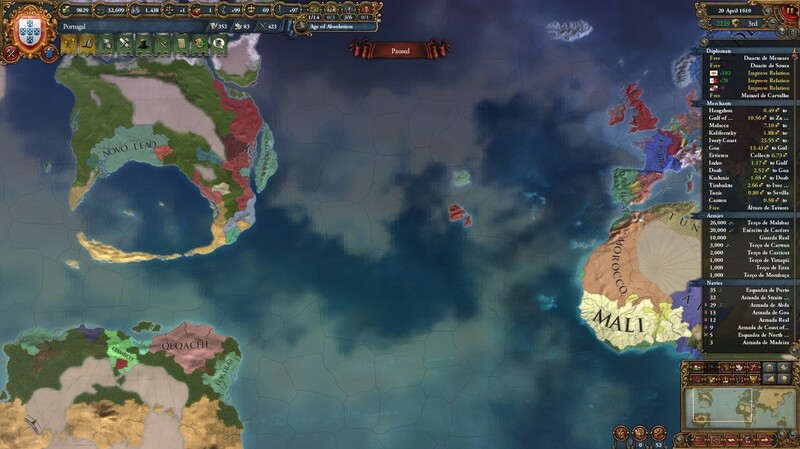 Afterward, Vasco da Gama turned his attention on wresting control of the Gulf of Aden from its Arab overlords with some significant success, but with his hold on Zanzibar still feeble, Henrique fully expected more wars to come soon in the far off region. With his army filled by new recruits, and stability at home in Iberia, King Henrique sent his commanders back to Zanzibar to reignite war with the sultan of Kilwa. At the urging of Portugal's merchants, the Portuguese army seized the lucrative markets of Mombasa and removed all vestiges of the sultan's control from the coast north of Zanzibar. However, Henrique died of illness before he could learn of his army's success, leaving behind his son to gain the credit for the conquest of the city and the surrounding coastline. ​While cardinals from Portugal had enjoyed unprecedented influence in Rome over the past several decades, the needs of Lisboa still fell behind those of Paris and the Italian states more often than not. Having had several successive Papal election alternate between French and Portuguese candidates, a rivalry between the two kingdoms solidified in Rome mimicked the foreign policy between the nations in Iberia. When Pope Clemens VIII was elected, formerly a cardinal of Portugal, he repealed much that had been accomplished by his French predecessor in order to undermine French authority and prestige, but when Clemens was succeeded by another cardinal from France, this process was predictably turned against the Portuguese. The two kingdoms would continue to vie for control of the Holy See as the heretical Reformation spread across northern Europe. King Joao was determined that his kingdom would remain at the forefront of ocean exploration despite the growing presences of the English and French navies. He financed dozens of expeditions and lost many ships and sailors as he pushed his explorers to find the western route to Asia. Lourenco de Brito, an explorer sponsored by the Portuguese crown from a small town outside Braganca, became the first man recorded to lead his fleet around the world. Departing from Lisboa, he traveled west across the Atlantic, past the colonies in Nova Galiza and Ulrici, and further into uncharted waters. They past many unknown lands, but their navigational predictions were verified when they finally found themselves in the seas south of China and were able to call at the small Portuguese colony at Pontianak for much needed supplies and repairs. From there they followed traditional routes home to Lisboa, completing their incredible mission, and bringing great fame and prestige to their kingdom. The kingdom of Castile, now much reduced and impotent, was falling prey to Muslim ambitions from North Africa. The Sultan of Morocco had liberated the lands of Granada from Christian rule, bringing them under his own, and was further expanding his foothold in Iberia at Castile's expense. The Aragonese had fallen into a union under the French king after his relative on the throne of Aragon had died without a direct heir, much to the dismay of their allies in Portugal, and French influence in the peninsula was rapidly rising. King Joao realized that Iberian independence in Iberia was now under significant threat, and steps would need to be taken to ensure Portugal's place. Declaring himself protector of the Castilians, Joao sent his armies to force the Castilians to kneel under his rule before they were similarly coerced by the Moroccans or French. However he was unwilling to commit fully, and settled for extending his domain to Valladolid. The king of Castile now held very little of Castile proper, ruling only over the cities of Madrid and Toledo. When the towns and trade ports that prospered around the growing harbor of Carwan, in the lands called Ulrici, had become too populous to efficiently control from Lisboa, King Joao followed in the footsteps of his mother and issued a second colonial charter. This new colonial government would be responsible for the internal administration of the colonies, but was also expected to render significant dues in tariffs collected from all shipping that passed into or out of colonial ports. Inheriting the throne as a minor, Sabastiao shared the start of his rule with his mother, Marie, sister to the Duke of Burgundy. Wary of the growing power of Paris, the Portuguese monarchy had declared its support for the Burgundians and hoped to keep French ambitions regarding the duchy in check. If this alliance could thwart Paris's attempts to dominate the French nobility, it might halt the powerful kingdom's rise. With direct control of trade ports spanning from Europe to India, the Portuguese traders were now in position to multiply their incomes by directly controlling the production of the valuable goods they traded in. This had started with the relatively peaceful establishment of colonies like Pontianak on Borneo, but starting an industry from nothing in the wilderness was a long and intensive process. The merchants desired control over the indigenous production systems that already existed in the regions population centers. With promises of monopolies and tax revenues encouraging his hand, King Sebastiao sailed an army across to Borneo and sent them against the Malaysian sultan of Brunei. The king was unwilling to send the majority of his forces so far from Lisboa, and the Malaysians fought valiantly against the Portuguese, using the jungle to strike where the Portuguese could not defend, but they could not defend the city of Brunei and were eventually forced into pitched battles that they could not win. The Portuguese forces seized as much of the sultanate's land as they calculated they could reasonably control along the northern coast, including Brunei itself, and forced the sultan to recognize the establishment of the separate realm of Kutai in the southeast, crippling his control over the island. The port of Fortraj was the first major European colony on the southern continent of the New World, but the harsh tropical climate of the region discouraged fast growth. Over time, however, this colony too expanded into townships and plantations as the jungles were pushed back from the coast and more money from the crown was invested into expanding the resources available and attracting settlers. Taking its name after its initial and most important city, the colonial government of Fortraj was chartered to govern this new frontier. When the duchy of Fez was attacked by the sultan of Morocco, King Sebastiao came to the small realm's aid rather than see Morocco recover any of the lands claimed by Christianity. The resounding victory of Christian forces allowed Fez to halts its decline and expand their realm at the expense of their aggressors, but left Portugal's armies battered and with little chance to recover before the king was forced to ship them to the defense of Goa as conflict broke out in India. While the monarchs of Portugal had long wished to expand their holdings in the wealthy lands of India, the region was held in a precarious balance by three major powers: the Maharaja of Orissa, the sultan of Jaunpur and the sultan of the Bahmanis. Portugal had enjoyed good relations with Jaunpur and Orissa, but the Bahmanis resented the foreign presence in Goa and were a constant threat to the Portuguese enclave. When Jaunpuri soldiers occupied disputed borderlands and initiated confrontation with the Bahmanis, King Sebastiao chose to support his aggression in hopes of weakening the Bahmani threat. A brutal war raged across the southern half of India for three years before the Bahmanis accepted significant losses of territory, including the secession of two more coastal cities to the Portuguese. For the second time in the century, Portugal was partially ruled by a Burgundian queen. Still quite young, the nobility accepted the Queen Mother as reagent until King Manuel came of age. Aware of the kingdom's ancestral connections to the house of Bourgogne, stemming from the father of Portugal's first king, Henrique de Bourgogne, the continued influence of the French dynasty was not begrudged and the Queen was widely respected throughout the realm. Though Great Britain now ruled a large colonial realm in Crafagh, and the French could claim a notable grip on trade goods from West Africa, no nation could come within a fraction of the Portuguese kingdom's power overseas. With the charters of Novo Andalus and Australia, King Manuel proclaimed that Portugal's power had now reached the edges of the world. While other nations struggled to finance investments into global influence, Portuguese settlers were rapidly taming various climates and indigenous peoples and sending the resources they found there back to Lisboa. The value of goods flowing into the ports of Lisboa, Sevilha, and Porto, rivaled and surpassed those passing through the Ottoman Empire's great markets of Istanbul. The wealth of Asia no longer required the ancient land routes to reach European markets, and now more of these resources reached Europe by Portuguese ship than by caravan. The capture of Brunei had allowed Portuguese merchants to compete with and manipulate the markets of the various local realms, and Manuel followed up on this by extending his hand into the countless primitive islands around Makassar. The port itself was a colony of the Malaysians from Brunei, but the exiled sultan's successor was unable to mount any defense when the Portuguese besieged the stronghold he had built on the island's peninsula as his new refuge. Makassar quickly fell into Manuel's hands and would help divert the area's spice trade onto Portuguese ships. Unfortunately spice prices had surprisingly plummeted and were no longer quite worth their weight in gold. The success of Portuguese merchants and others in bringing these luxury goods home had surprisingly saturated European markets and reduced the value of the commodity to more accessible levels. The second Indian War erupted in almost in similar fashion to the first, and Manuel found himself reliving the decisions of his father. Once again Portugal backed the ambitions of Jaunpur and Orissa, and gained substantial lands in Gujurat that controlled trade along the Indus River. The war allowed several states to free themselves from Bahmani rule, the largest being Malabar. The newly enthroned raja of Malabar found his realm's independence immediately threatened by the Maharaja of Orissa, and turned to the Portuguese as a potential ally. Recognizing Malabar's substantial wealth, King Manuel risked Orissa's anger and occupied the small nation's cities himself at the raja's request. Malabar would swear fealty to the king of Portugal in exchange for autonomous rule and protection. With the blessing of the Pope, King Manuel declared his intention to rid the Iberia Peninsula of Muslim rule. Areas of Granada had fallen under the control of the Marinid sultans, and from there they had conquered the fertile lands of Jaen and the gold mines of La Mancha, taking them from the weak grip of Toledo. King Manuel already claimed to protect the Castillians of Iberia, and finally forced Toledo to acknowledge his primacy by occupying the city and disbanding the meager armies still loyal to the Castillian monarchs. Though it took more than a year to handle the diplomatic formalities, he eventually achieved international recognition for the formation of the duchy of Castile in vassalage to the crown of Portugal. From Toledo, he called for a Crusade against the heathens that would unify his Christian subjects and bring soldiers from across Iberia into the Portuguese ranks. Under the king's command, the crusade reclaimed Castile's lost Andalusian lands and pushed Moroccan influence out of Iberia completely. After the king of France abolished the Aragonese Noble Council and ended all autonomous rule of the kingdom of Aragon by officially integrating the realm into the French kingdom, monarchs across Europe grew concerned about the seemingly unstoppable power of the French ruler. Supported by the armies of the Holy Roman Emperor in Wien and the powerful Duke of Burgundy, King Manuel declared war in the name of the Catalan people. The conflict wrought great destruction across the lands of France and Burgundy, but concluded with only minor concessions by the French. The attempt to weaken Paris's grip on Catalonia was a failure. Holding dominance over Iberia and expansive colonial territory across all the seas of the world, Manuel declared that a new era had begun: one dominated by the hegemony of Portugal. To resounding acclaim throughout his realm, Manuel was crowned again as the first Emperor of the Portuguese Empire. Less than a year later however, Manuel's great rival followed suit and announced the dawn of the French Empire from Paris. Long accustomed to bearing only one such a laudatory title within its borders, Europe was now home to three competing Emperors, but neither of the others could rival the Portuguese presence worldwide. At the bidding of the Portuguese East India Company, Emperor Filipe financed an invasion of the Hindu trading ports along the western coast of Java. While guerrilla tactics allowed the local warriors to cause substantial damage to many of the Empire's colonial towns, the Portuguese forces stationed in the East Indies were able to quickly occupy the region's important coastlines and ports. 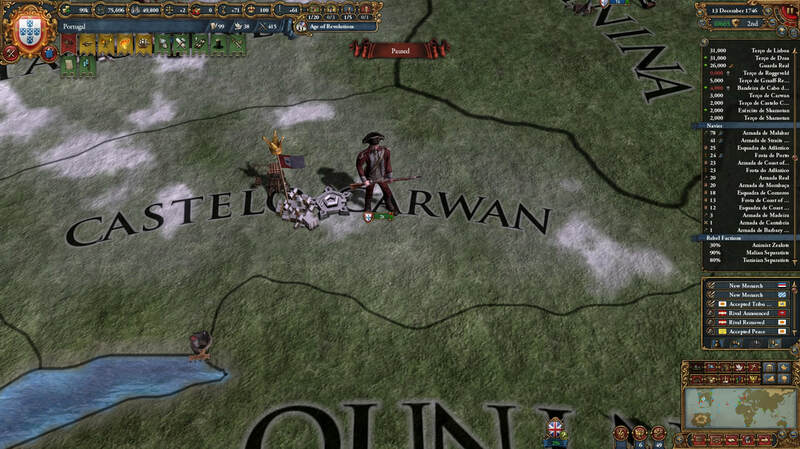 The defenders of Majapahit were unable to stand against the Portuguese in open battle and were forced to abandon their most western territory, leaving it in Portuguese hands. With no clear regent among the immediate family of the young Emperor Jaime, a council of nobles handled most of the administration of the Empire during the first years of his reign. The preexisting rivalries and disagreements among the council's members rendered the body inefficient and ineffective, but the Empire nevertheless remained stable through this period of uncertainty. The Jesuit church found fertile ground in the far east and gained legions of converts among the Muslims and pagans of Brunei, Sumatra, and the Moluccas. The Emperor's governors of his overseas colonies generally supported the work of the missionaries despite the unrest it created among the communities targeted by the priests. The long lasting stability that was created by bringing those they would rule into the Portuguese Catholic Church and binding them with common language, symbols, and belief, was well worth the means by which this was achieved. However, there were some large population centers where the local communities proved too tightly knit for the missionaries to penetrate, and uprooting the Hindu or Muslim traditions of these cities was put aside by order of the East India Trade Company for the benefit of economic relationships. Jaime had studied Emperor Manuel's failed plans to rid Iberia of French influence and shared his grandfather's ambition, though he was determined not to repeat any of his mistakes. With the French emperor already engaged in a colonial war with the kingdom of Great Britain, Jaime found the time ripe to attack his rival and assert his influence in Iberia. Relying upon the strong defenses of Cantabria and Old Castile, the Portuguese armada brought Jaime's army to his ally's ports in the Burgundian Lowlands, uniting their forces in preparation for a push into the French heartlands. Outnumbered and ill-prepared for a second war, the French defense quickly fell apart with the enemy soldiers abandoning Paris in the face of the offensive. After the city fell, along with all other defenses on the Burgundian borders, their Emperor was forced to peace talks. He agreed to recognize the creation of two kingdoms by granting independent rule to both the Catalans and the Sicilians of the former Aragonese realm. Emperor Jaime expected the new monarchies of these kingdoms to be duly grateful and favorable to Portuguese influence in the Mediterranean. Only a few years after the Liberation War, Portugal was again mobilizing against France, called to arms by their Breton allies. Deprived of his control over the Catalan coastline, the French monarch had turned his ambitions against his western neighbors and sought to subjugate Brittany. Only months into the war, the aging Emperor Jaime passed away, leaving his son to deal with his old enemy. Young Afonso proved up to the task, and brought the French to a cessation of all hostile activities after an efficient campaign across the Pyrenees and as far north as Poitiers. The French wars would continue to span the next decade and major hostilities were renewed when the Burgundian duke pressed his many claims in southern France. The French Empire had suffered a series of defeats at this point in their attempts to reclaim Sicily and could not defend their extended boarders in their weakened state. Paris was occupied a second time by the troops of Portugal and Burgundy, and the French Emperor was forced to sanction the crowning of Charles de Bourgogne as the first sovereign king of Burgundy in over six centuries, and cede many lands in southern France to the new king including the fortress of Lyon. Increasingly, the burgher factions within the Empire that dominated the trade companies of the Far East were eyeing the Chinese coasts with equal parts avarice and resentment. Unable to secure any power over their markets diplomatically, Maria consented to their appeals to pursue more martial action, well aware of the worth of Chinese trade goods and their markets. However, the Empress and her court found no realistic opportunities to fracture the monolithic Ming Empire and continued to defer any action against the Ming rather than initiate a conflict that could endanger their markets from India to the Moluccas. The trade companies, frustrated by Maria's inaction, withdrew much of their voluntary support for her future endeavors. Maria's short reign left her son under the care of her husband and the powerful house da Camara. With ties to the old nobility of Pamplona, Joao da Camara continued to foment conflict with the French who ruled the old Basque regions. His regency saw increased recruitment on the Portuguese mainland and preparation for war with the French Empire. The region of the western Pyrenees has been under French control longer than any other region of Iberia and the culture of the region had changed significantly, now having more in common with the inhabitants of French Gascony than with their southern neighbors. This was no deterrent, however, to calls for independence from the noble families with roots that reached far deeper than the French Empire and chafed under its control. Regent Joao da Camara, related to much of this nobility, declared war in their name and for the Portuguese claims on the lands of Old Castile. His alliance performed admirably and the French Emperor was once again brought to the negotiation table for the purpose of limiting and reducing his imperial reach. The lands surrounding Pamplona were ceded to the Portugese and formed into the Vasconian March under Margrave Evrard da Camara. This would finally and firmly push the French out of Iberia completely. With the rise of another Portuguese cardinal to the Holy Throne. The outrage over the Neapolitan hold on Rome was renewed, but it still surprised rulers across Europe when the young Manuel II declared war on the Neapolitans to right this century-old disgrace. After the initial pitched battles south of Naples, Portuguese troops occupied much of the Italian peninsula until the reestablishment of a sovereign papal state was secured to the glory of the Catholic faith. Once again the influence of the trade companies, and the weight of their purses, was being clearly seen in the politics of Lisboa. Struggling to monopolize the trade lanes along India's eastern coast, pressure for war with the Empire's old allies in Orissa was growing. Soon enough, the Portuguese armada was blockading the eastern trade lanes, while the Portuguese army moved into Mysore. The regions between Mysore and Goa saw many bloody battles, but almost all ended in favor of the Empire. Manuel seized Mysore itself from the Orissans, a city that exported some of India's most valuable goods, as well as all of Ceylon to serve as the Portuguese power base for trade control along the eastern coast. Filipe II hungered to begin his reign with conquests to match his father's, and so turned his eye on Japan. With the exotic goods of this region recently becoming widely available in Europe thanks to the ever expanding Portuguese and British trading companies, Japan was a subject of fascination on the mainland. As they had done in India, Filipe wished to gain control of these goods himself. Portuguese missionaries had long been active in Kyushu and it was here that Filipe's commanders sought to establish his rule. By backing the ambitious king of Korea, Filipe found his excuse for an invasion. The Korean and Portuguese occupation was fiercely resisted by the Japanese, but ultimately successful, as all of Kyushu was claimed by the Portuguese empire, save the ports of Bungo. ​Although far from the borders of Portugal, the great foe of the Catholic world for the past two centuries had been the empire of the Ottomans. The emperors of Portugal were traditionally supporters and allies of the Holy Roman Empire and its rulers in Vienna, and willing to assist them in their struggles with both heretic and heathen alike, so when the endless ranks of the Ottoman army began to advance past the borders of Bosnia and Austria, Emperor Filipe II pledged the soldiers of Portugal to the cause of the Holy Roman Empire. The majority of the bloodshed over the next two three years occured along the banks of the Danube and in the Carpathian Mountains, but the Ottomans also sent forces through North Africa to besiege the forts of Cueta. The Mediterranean Sea itself was bitterly contested, but the great galleons and warships of the Portuguese armada defeated the endless Ottoman galleys, confining them to the harbors of the Aegean and allowing the Catholics to blockade the Ottoman cities and fortresses. When the allied armies in Austria eventually routed the Ottoman forces, the defenders became the attackers and the Balkans were occupied by the Catholics up to the walls of Istanbul itself. Weary of the war he began, the Padishah in Istanbul relented and ceded much of his Carpathian borderlands to the Holy Roman Emperor. Emperor Filipe II's rule saw far-reaching reforms in the empire's administration that brought a nation endangered by complacency and stagnation back to the forefront of technology, mercantilism, and legal philosophy. However, these reforms were the creation of his most brilliant adviser, Sabastiao Jose de Carvalho e Melo, the Marques de Pombal, who also masterminded their passage and implementation. The Marques was consistently supported by the Emperor and accumulated unprecedented power for an adviser over the course of Filipe's reign. When Filipe was succeeded by his son, Joao III, there was a serious attempt to address the Marques's consolidation of authority by his fellow aristocrats in the court of Lisboa, but after a few years of uncertainty, Joao III continued his father's support of the Marques de Pombal's work, and those who dissented were ruthlessly suppressed. The Sultan of Morocco, from his seat in Marrakech, had brought the various tribes south of the Saharan under his rule. Although the Portuguese were well defended in North Africa, Moroccan soldiers now threatened the borders of the Portuguese territories in Guinea, including many cities and markets that were vital cornerstones for the shipping lanes that connected Europe to India and Asia. Emperor Filipe II decided that he would challenge Moroccan authority in East Africa, and attacked the Sultanate from both north and south. Portuguese forces were able to easily occupy the vulnerable city of Marrakech, forcing the sultan into exile, but fighting in the harsh jungle environment of Guniea dragged on for three years. When the war concluded, Emperor Filipe II had extended his control in Guniea further inland, where he would build forts to protect his valuable coastline. ​that this British pretense of equality could not be tolerated and mobilized his empire to capture the whole of South Africa and strike at British holdings from Crafagh to Indonesia. Though never able to decisively eliminate the British navy, the armada of Portugal was able to control the seas and dictate the war as Joao saw fit. Despite interference from Ming China, the war saw major gains of territory for the Portuguese colonies in Ulrici as well as South Africa. As Burgundian power rose at the expense of their French rivals, Portugal found itself increasingly at odd with their old allies. When war erupted between Poland and Austria over the Silesian border territories they were facing each other on opposite sides of the battlefield. 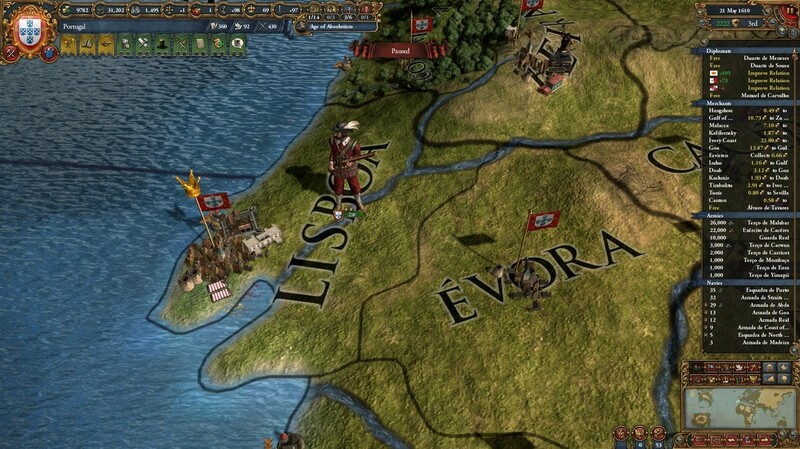 This war also saw the first events of a continuing conflict between the Brabantian colonies in Ebbi and those of the Portuguese. This war saw no change in Portuguese holdings across the world, but cause dramatic shifts in the empire's foreign policy. Emperor Joao, backed by his ambitious trade companies, continued to plan for an eventual invasion of China to secure access to its limitless markets and production potential. Part of this plan was an alliance with the Korean kingdom, threatened by the Ming and willing to fight for their continued independence. Unfortunately this brought Portugal into war against the rapidly expanding Russian Empire when the Russians decided to claim the far northern territories held by the Koreans. To fight the Portuguese, the Russians called on their Indian allies, the Jaunpuri, and war raged once again along the Gujurati coastline. While Jaunpuri were crushed and relented their assault, the Korean were unable to hold back the Russian army and were forced to relinquish much of their Manchurian provinces. The expansive jungles that lay between the distant colonies of Fortraj and Novo Andalus were inhabited by a politically unified people known as the kingdom of Quqache. Though not properly utilized by its inhabitants, the land was rich in dye and sugar crops. 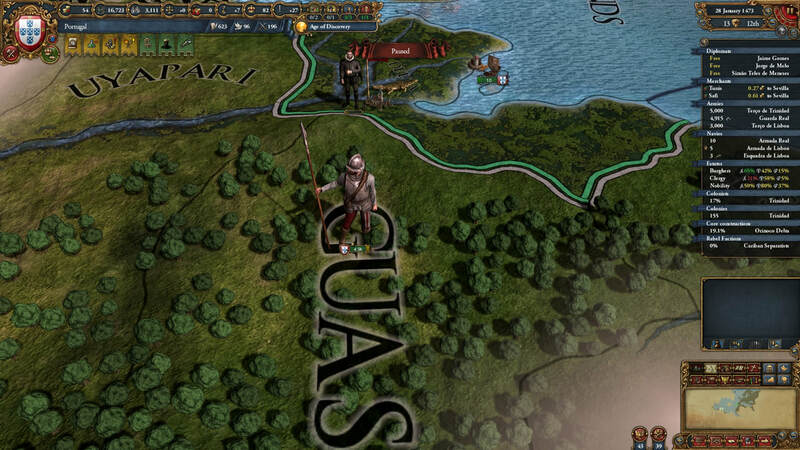 When Emperor Joao was informed that Brabantian colonist had begun landing on the shores of Ebbi and claiming much of Quqache's coastal land, he ordered that this kingdom's people be forcibly placed under Portugal's protection. The king of Quqache was quickly cast down, his soldiers armed with only outdated muskets and poor steel, and this vast network of jungle villages was placed under the control of the governor of Novo Andalus. Its people would prove problematic to assimilate into Portuguese culture, but the efficient development of their goods production would greatly expand the Portuguese treasury. Emperor Joao died without leaving a direct heir to his throne, his only son having died many years before. Through a past marriage, the throne passed to the influential House da Camara. The line de Avis had ruled Portugal for close to four centuries, and the newly crowned Emperor Antonio chose to exhibit his families connections with the old dynasty as often as possible to help legitimize his ascension. A cadet branch of the de Avis house, using the de Avis name, would continue to rule the duchy of Vasconia which, ironically, was a seat once held by the da Camara line. Awarded the title of Defender of the Faith by the Pope soon after his coronation, Emperor Antonio felt it was his duty to defend the small Duchy of Fez when it came under attack by the sultan of Morocco. Though the Moroccans were placed to simultaneously threaten Portugal's cities in North Africa and in Guinea, spreading the Portuguese forces thin along these borders, the sultan was unsuccessful and the Emperor seized lands further inland to help defend against future conflicts. While Portugal may have already dominated the movement of trade goods in the countless islands of Indonesia and Malaya, the kingdom of Ayutthaya was a constant thorn in Antonio's imperial side. Consistently hindering the movement of Portuguese trade and stirring unrest against the Europeans, Antonio looked for a way to definitively silence their opposition. He focused on the city of Malacca, Ayutthaya's most prosperous port and an important linchpin in the region's trade. Calling on the Portuguese army's experience in jungle warfare and maritime logistics, Antonio's commanders conducted a comprehensive assault on the enemy kingdom's holdings all along the Malaysian coast. With their fleet sunk and their armies pushed north into the dense jungle of central Thailand, the king of Ayutthaya was forced to allow the annexation of the southern extremes of his realm, including the city of Malacca. These provinces would be delegated to the governance of the Indonesian Trade Company. Plaguing both Portuguese and Ming trade routes alike, incessant pirate fleets used the islands of Indonesia to prey upon the region's trade ships. When the most famous pirate leader of the South China Sea was caught by Portuguese authorities in Malacca, Emperor Antonia risked great embarrassment by ordering her pardoned and employed by his own navy. Ching Shih, the Pirate Queen, went on to loyally plunder Ming trade for the Portuguese crown until her retirement. Portuguese wealth and power had become obviously reliant upon income from overseas holdings and control of the seas and coastlines. While the empire's European domains were substantial, its ability to compete and negotiate with the sprawling empires of the Ottomans, the Ming, Austria, Burgundy, and Russia was clearly derived from elsewhere. In a momentous speech, Emperor Antonia detailed this truth to the court of Portugal, referring to the Empire of Portugal as the world's greatest Thalassocracy in the tradition of Phoenicia, Athens and Rome, and revealed his plans to reinforce the empire's vital control of world's oceans. He recognized that without command of the seas, his empire would count for nothing. Ascending the throne as a minor, the young Antonio's rule would act through his mother Empress-Reagent Beatriz da Maia. Beatriz's family hailed from the wealthy province of Coimbra and her rule would show notable favoritism for the nobility of this region. Portugal was given an opportunity to challenge the Ming once more as they were called to war in defense of the kingdom of Korea. The Ming timed their assault to coincide with a Moroccan attack on Portuguese Guinea, and it took almost two years to repel the Moroccan forces and bring the beaten sultan to the negotiating table, but this finally freed Portuguese forces to assist Korea against the Ming. Unfortunately, those two years had coast Korea dearly. After crossing the vast oceans, Portuguese soldiers stood shoulder to shoulder with the remnants of the Korean army as they faced the Ming legions in the mountainous lands of northern Korea. Despite favorable terrain and initial victories, the alliance could not hold its ground against the concentrated assault of the Ming army. The Portuguese navy sunk every Ming ship that dared to leave its harbor and the fleet's marines captured vulnerable settlements all along the Chinese coastline, but the Ming assault into mainland Korea was relentless and they soon stood outside the walls of Hanseong. The Korean's surrendered to the Ming and accepted their supremacy. The chances of Portuguese expansion into China looked more bleak than ever. Due to Korea's new status, the Ming rose to protect Korea from the advance of Russian forces into its domain, and Portugal now found itself on the same side as their former enemies. Emperor Antonio pulled his forces back from Korea however, not wishing to come between the Russian and Ming armies, and ordered his commanders to focus their efforts on Russia's ally in India, the Sultan of Jaunpur. The battered armies of Portugal defended the empire's Indian coastline and defeated the Jaunpuri in multiple engagements before the Russian emperor relented and ended the war. As were his predecessors, Emperor Antonio found his realm locked in endless conflict with its Moroccan and French neighbors. Fortunately Antonio also proved to be as capable as his predecessors, and Morocco was once again soundly defeated. With Portuguese soldiers holding both Paris and Marrakech, expansions of the Catholic border realm of Fez and the Vasconian Marches were declared as well as the release of tribes subjugated by the Moroccans on the borders of Guinea. These tribes gladly accepted the protection of the Portuguese Empire. Although the chinaware and other trade goods of Canton might have proven inaccessible for the Portuguese, the lands of Japan were beginning to look comparably attractive as they produced many of the same goods and were similarly well developed. When the Korean king sent word of aggression from the Japanese, Antonio gladly sent his ships and men across the seas to assist. Working together, Antonio and the Korean king had occupied the southern half of the Japanese realm and had taken the capital of Kyoto. Now regretting his belligerence, the ruler of Japan ceded the peninsula of Hizen to Antonio and the gold mines of Izumi to the Koreans. With this foothold, Antonio would return a decade later and revisit the southern cities of Japan with his Korean allies. With further control over the situation and a decisive victory over the Japanese army, the emperor seized the prosperous provinces of Suo and Chikuzen, all of Kyushu except for the port of Bungo, and assisted in the expansion of Korean control over the provinces bordering Izumi. As the unified colonies of Novo Andalus had grown so had their sense of self-sufficiency. Emperor Duarte's predecessors had already been forced to tolerate extensive periods of unrest in which tariff payments and military obligations had been neglected until embarrassing concessions had been made by the crown to appease their colonial government. 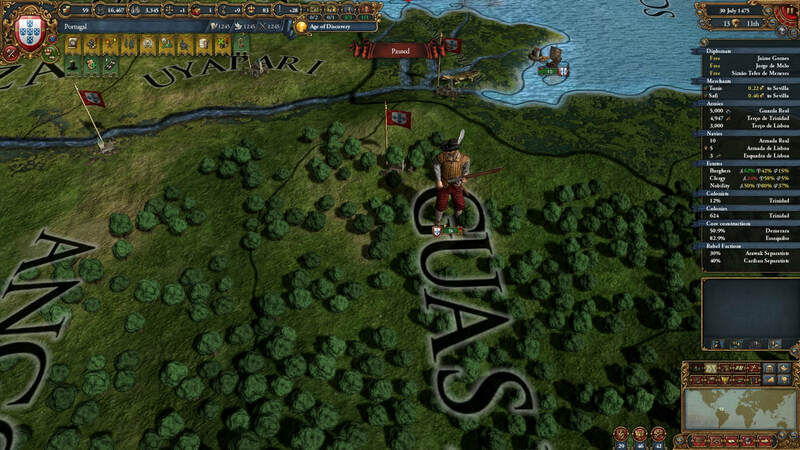 To exemplify the colonies need for imperial protection and assistance, Duarte decided to instigate a war with the colonies' Brabantian neighbors. The Brabantians were fairly outmatched along the northern coast, and the colonial militias of Novo Andalus pushed them into the sea where they retreated to the Benseber isles. 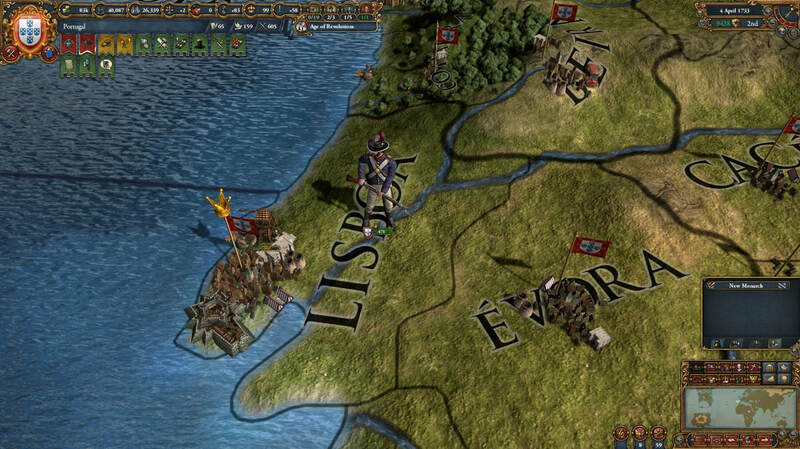 From Lucaton, in the southwest of Ebbi, the Brabantian holdings were stronger and their own militias were able to threaten Nova Sevilha, but they recognized that they would not regain the northern coastline. The defeated Brabantians acknowledged their loss of the territory, and Novo Andalus was victorious. The losses suffered in the war would calm the rising independence movement in the colonies for a time, but Emperor Duarte did not delude himself. It would return quickly and stronger than before.